The Best Dry Shampoo I’ve Used! If you’re not at all familiar with the concept of dry shampoo then perhaps a quick description is in order. What it does is, excess oils are absorbed to provide the look of freshly washed, pleasantly scented hair in a very short time. A fabulous time saver for women on the go. In a pinch, it’s a very effective method that closely mimics the results of the often time consuming, yet time honored routing of actually washing, rinsing, drying and styling. 1. Shake & Spray: Periodically shake your head as you gently spray towards the roots. Keep the nozzle roughly one foot from your head as you lightly spray. Shake the can vigorously prior to use. 2. Rub It In: Gently, but firmly massage with the tips of your fingers. Let it sit for a short time. 3. Style: As desired, groom into the look you want. For my coif which is thick, long, and curly with oily roots and dry ends, I’ve gone through several products to get the results I needed. That being said, consider this when making your choice. Is your hair thin, or is it like mine?. Do you think the results will be the same if your hair differs from mine?. Food for thought. Okay then, let’s end the suspense. 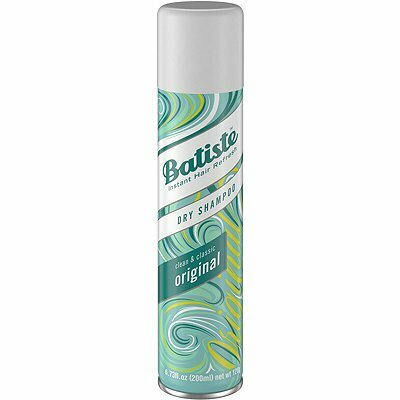 I use Batiste Dry Shampoo. Why you might ask. Well, it’s like this, during my search for the right product to tame and solve my particular styling and hygiene issues, I found that for me personally, and for my roommate who has quite the opposite problem from me which is thinning, this product gave us both the best all around results. Regular shampoo uses sulfates, which by acting with water, bonds to the oil, so it can be rinsed away later. Baptiste, instead, uses a starch to absorb oil without the need for sulfates. For me, with a bit of effort, I get a revived, just washed look with just a hint of a light airy scent. No more of that oily look for me. For my friend, she gets a look that masks her thinning head, diminishing her beauty related self-conscience tendencies, while simultaneously boosting her confidence. Baptiste has been great for both of us!. Less of that oily, greasy look for me and more body for her. A win-win! I will say this though, they do need to work on the scent, but since it is a light fragrance, and not overpowering, it’s tolerable even if not my favorite. Thus endeth my only critique. As a college student with oftentimes no time for my normal hygiene routine with only one bathroom and a female roommate with all the academic and social demands on my time, Baptiste works great!. It also serves to make me appreciate when I do have the time to unwind and pamper myself in the more traditional and utterly sensual luxurious bath or long, warm shower. Hope this helps!. It works for both my roommate and I. Note : This is a guest post. Introducing Sunsilk’s First Range of Dry Shampoo! Sunsilk introduces the brand’s first range of dry shampoos, co-created with some of the world’s best hair experts to provide solutions to every day women. The latest innovation from Sunsilk helps refresh hair in 1 minute without water in three easy steps: spray on the roots, massage into your hair and brush to absorb the oil. Sunsilk Refreshing Dry Shampoo range offers three variants to cater to the different female hair needs: for normal hair, greasy hair and colored hair. The entire range strives to refresh limp lifeless hair, absorb excess oil and enhance volume without a heavy dull finish. Jamal Hammadi, Sunsilk Co-Creator and Shine Expert, co-created the Sunsilk Refreshing Dry Shampoo for normal hair. “Dry shampoo is great as you can skip a shampoo without having greasy hair but maintain volume and texture: spray in the morning, spray at night, spray any time of the day you need! Girls can now give their hair a break without losing out on style!” he says. The Sunsilk Refreshing Dry Shampoo range can be found in all major supermarkets across the UAE starting at AED 17 for 100ml aerosol bottle and AED 25 for 200ml.